Can't decide on kitchen creation, talk to us! Just a note to express our thanks for designing and installing the kitchen cabinets in our new house. Your patience with us in the concept stages-several trips to meet us at the house and our visits to your showroom-was greatly appreciated. 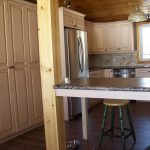 Then when you arrived at the house with the cabinets and the pieces were wrapped in foam, it showed how much you cared about your work and the customers first impression. The assembly and installation of the cabinets was done with extreme care, accuracy and you and Garett didn’t accept anything but perfection. The finished product is immaculate. 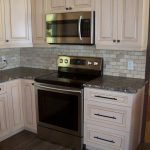 We certaintly will be recommending you to anyone we meet that is thinking of installing new cabinets. drawers! I love the farmhouse design and the motion sensor night light! Designer Kitchens was the only company where I could get the product I wanted. Big box stores offered what was in the catalogue, without changes. 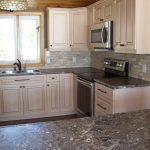 Designer Kitchens cabinets are custom coloured, smooth and flawless. Mine show the beautiful grain. Owner Phil Vickers measured, re-measured, accepted our changes, and consulted with us many times to ensure that everything would be perfect, to his high standards. Workmanship and installation were superlative. Customer service (because there will always be little things to attend to after installation) was very satisfactory. Everything was done in a timely fashion. Designer Kitchens is owned and operated by Phil Vickers. 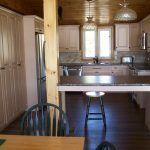 The Designer Kitchens team of professionals have been designing and building dream kitchens in Ontario for over 14 years. Copyright © 2019 Designer Kitchens. All rights reserved.